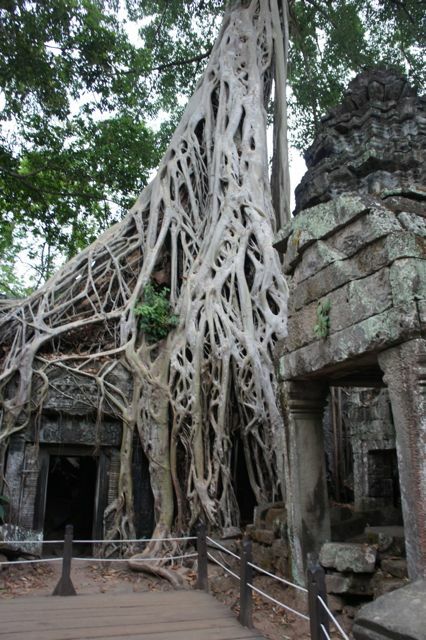 Many of the temples of Angkor Wat are covered in jungle finery. 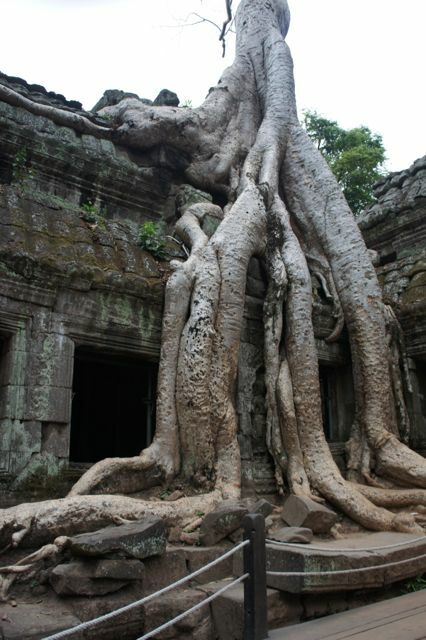 My most anticipated visit was to Ta Prohm where enormous rooty trees have laughed at the massive stone structures and crawled right in to be comfortable. It’s amazing to see how a tree such as the tall white-barked Srolao tree creeps emphatically where it wants to and often pushes out the ancient stones, now being replaced in this temple. Trees are sky-scraper tall and shady all over this city, which is a blessing against the heat. I’ve had the good fortune of being here on cloudy days with spouts of rain coming through now and then. Thank you Jesus. Ta Prohm at dawn allowed us to be the only visitors so we wandered freely. This temple was built in 1186 to honor the king’s mother. Nice gesture. We visited Bayan Temple as well. It is level upon level of four headed towers - some sort of sour faced, some absolutely beautiful with Mona Lisa smiles. Some have flat nose profiles, the women (probably Divas) have sleek pointed profiles. 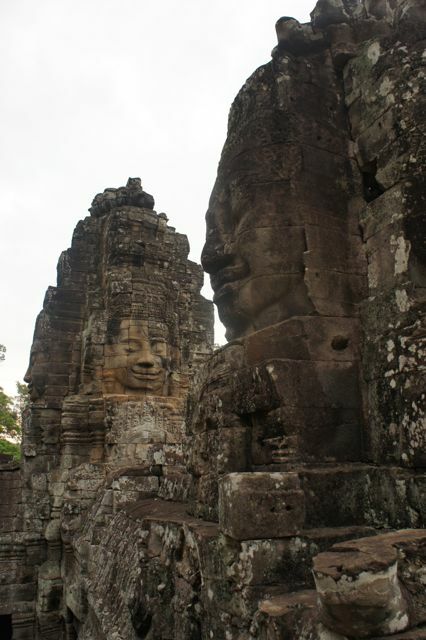 They speak of a history of Khmer culture which is the cornerstone of Cambodia. Here at Bayan was another even more incredible bas-relief telling the story of life in the days of yore and very much present in the art are trees, identifiable by the leaves. It has detail of family life, blowing a pipe to bellow a fire, cooking a pig, eating rice, having a baby, whatever life entailed, carefully chipped into the stone. 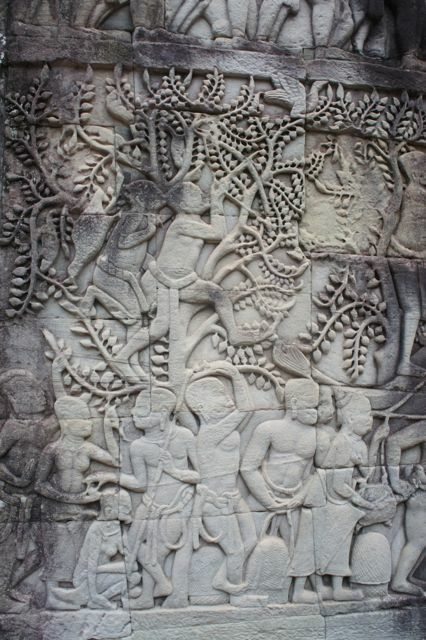 Once again, lots of repetition of form, which always amazes me in nature and ancient concepts of how to express abundance as we learned about Egyptian art, now here in Cambodia on the Angkor Wat temples. At Bayan, however, there was more. 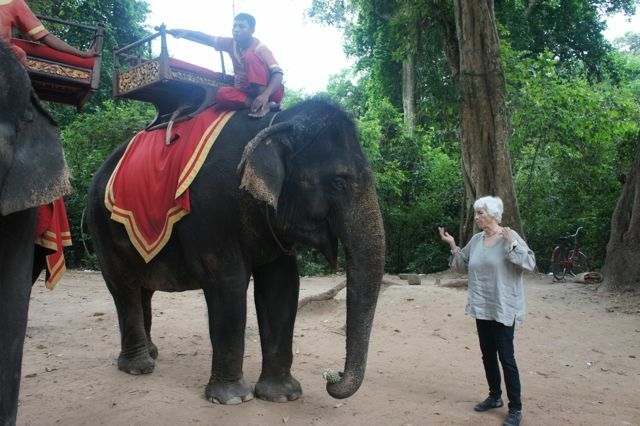 At one of the very distant gates (probably a mile away), I was able to ride another elephant. This was Che-tan, who was one of the black-skinned elephants with a topnotch of hair on top of her head. 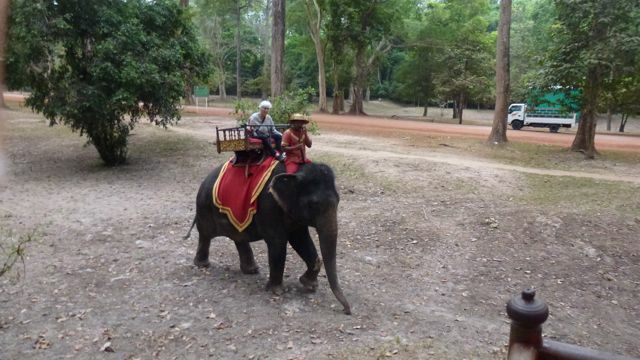 The Mahout was dressed in red and gold to match the long blanket under the saddle, and this time I had to take a back seat and ride her very rough sway in one of the seats. But, hey, I’ll do anything to be able to ride an elephant. First as we walked along the very very crowded road into the temple areas, we dodged hundreds of pick up trucks filled with up to 25 kids and family members, huge tourist buses, thousands of tuk-tuk (opened cabs pulled by guys on motorcycles) and just people people people. We made it to Bayan after and the crowds were already stacking in at 7 a.m. Apparently there is one more day of New Year’s celebration. 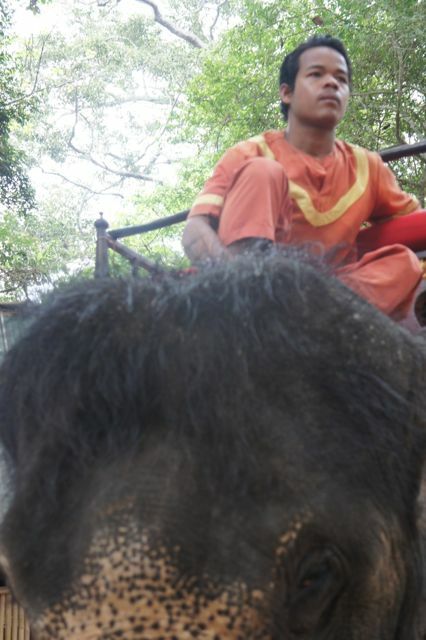 The ride was enhanced by my mahout picking leaves off a tree and playing leaf-music all the while. When we ended the one hour ride, I could feed Che-tan pineapple (not bananas, I’m told, they cause diarrhea. Little do I know.) In Laos, bananas were OK.
Other events today were lunch at the popular Foreign Correspondents Club, a fancy French restaurant wide open to the heat, fans blowing like crazy, and service quick. You could have Cambodian or even pizza and pasta. Alas. Not my type. But near the club was an incredible little store of inventive crafts and art called WA gallery.concept.store. 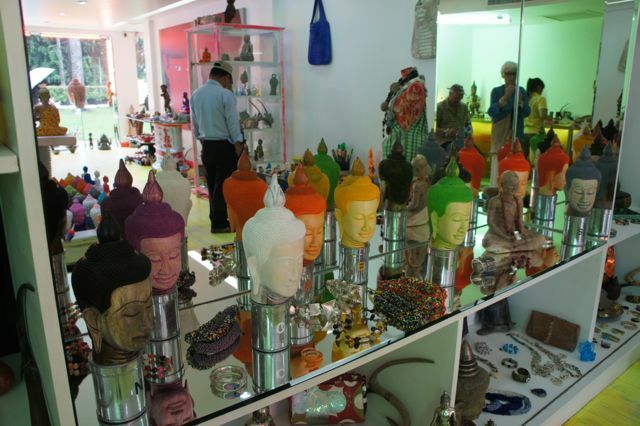 One artist had taken a dozen of the traditional heads of Buddha with the hairstyle of little balls and a dome bun and painted each one shocking colors with stripes and polka dots on the hair bun. It was charming and all sorts of unusual jewelry and items made of sting ray skin, the new favorite, I guess, was a bright reprise away from the tedious tourist selection of local crafts. We went to a crafts center that had good intentions and a typical shop filled with silk products, wood products, and Hindu-Buddhist statuary at every price. 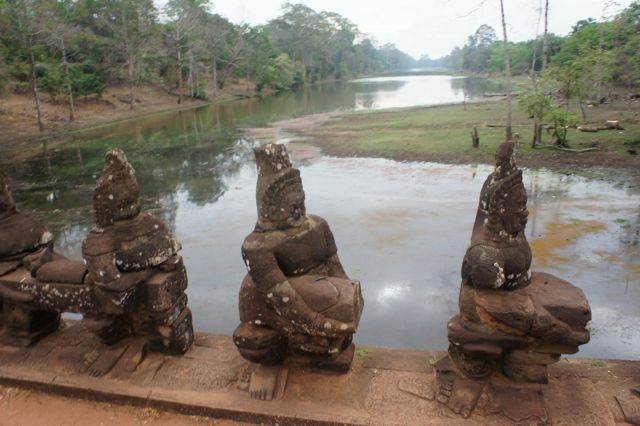 But this is a crafts “village” where young people with handicaps are given a chance in life and carvings in wood and stone are assigned to them in the huge restoration project constantly needing help at Angkor Wat. Some are deaf and only communicate by signs, and a chart of the signs hangs on the wall. A rather iffy thing was becoming aware that crocodiles are bred at a farm right in the city to be turned into pocketbooks, belts and wallets. Masses of crocodiles, who, when the rains come and there is flooding, can become a nuisance are destine for the knife. I also saw big glass jars filled with I hope dead baby crocs in a liquid. I didn’t ask what that was for. Alas. 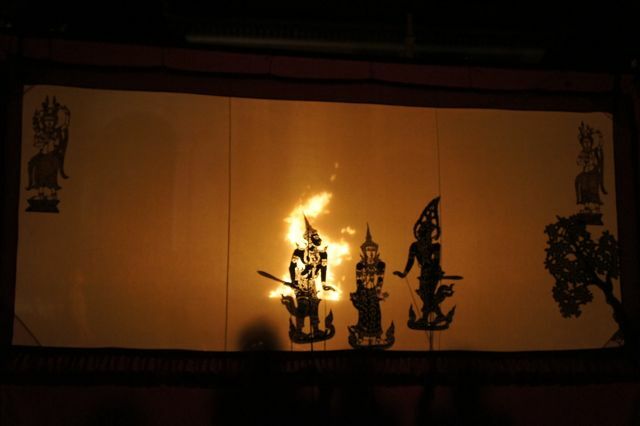 Before dinner, I was finally able to see a shadow puppet show, which was arranged just for us. Part of my master’s degree in theater at University of Memphis in 1972 was a thesis production - which I did with the great puppeteer Jim Crosswaite - a part of which used shadow puppets (Indonesian style). Here leather is patiently punched and cut in intricate forms and designs by a young girl from the Sreyroth family into players of themes extracted from Ramayana and other Khmer myths. Sadly, these hand made puppets are a dying art. In the middle of a dark Buddhist temple grounds with a huge cemetery of stupas, the family had set up a scrim and built a fire of coconut husks for light, for a 45 minute show. Of course I don’t understand Khymer language but the drama was full of fighting and laughter, I figured because the musicians and helpers were laughing. The artist’s puppets were like lace with expressions and form. Afterward, back at the unique hotel restaurant, as I ate young banana tree with smoked fish and sweet turnip salad, we were entertained by the Apsara cultural dancers from ancient Khmer tradition. These dancers with the gold headdresses and brightly colored regional costume, bare feet with toes that bend upward and fingers that contort in shapes symbolizing, stem, leaf, bud, flower, fruit, (which take years of flexibility work) are the heavenly angels - half women/ half goddesses - of this culture. I’m cultured out. Now we’re off to Vietnam. I have to say this: Go Grizzlies!